With countless hidden treasures along the Central Coast, visitors are bound to want to explore. 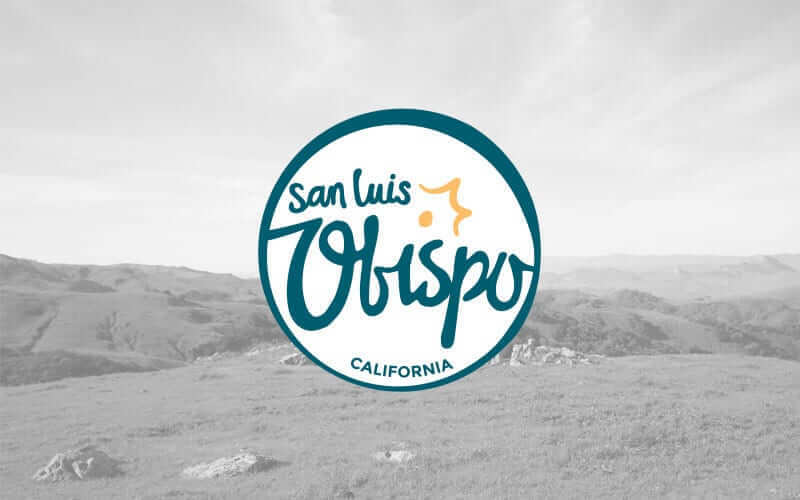 San Luis Obispo acts as the perfect adventure hub whether you’re taking a day trip to Hearst Castle or venturing down to Solvang. Explore our day trip ideas full of endless things to do in San Luis Obispo County and surrounding Central Coast locations. Avila Beach is a picturesque beach town with a collection of local restaurants, ice-cream shops and wine bars. This small town offers many things to do including biking, paddle boarding, apple picking, wine tasting and more. Just a short 15-minute drive from San Luis Obispo, Avila Beach makes for the perfect day trip while visiting the Central Coast. 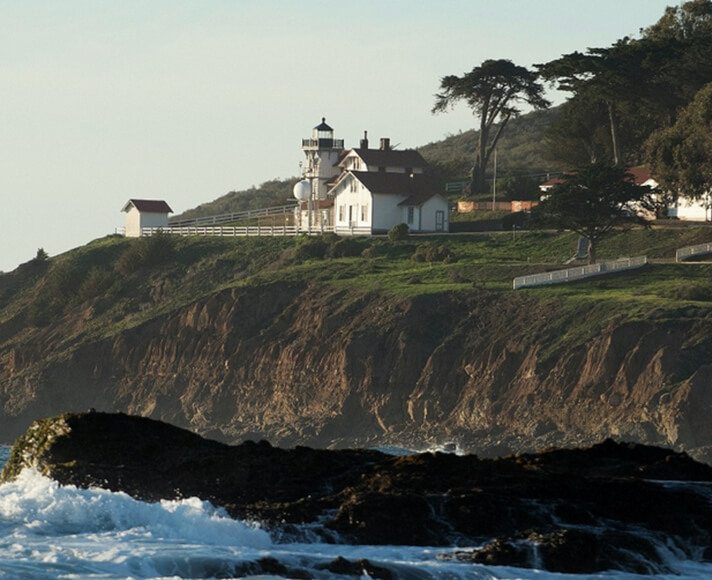 Point San Luis Lighthouse: Travel back in time and explore the historic Point San Luis Lighthouse on their docent-led tours, happening every Wednesday and Saturday. You can reach the lighthouse by hopping on a docent-led hike, a classic trolley ride or by kayak. Biking: Grab a bike and cruise down the Bob Jones City-to-Sea Bike Trail, a 3-mile paved path that runs from Ontario Road to the Pacific Ocean. If you didn’t bring a bike, you can rent one in town or from Pedego Electric Bikes in Avila Beach. Avila Valley Barn: Stop by Avila Valley Barn, a favorite local spot featuring tasty treats, a petting zoo and hayrides in addition to seasonal u-pick apples and pumpkins. Avila Beach: Avila Beach won’t disappoint with its expansive beaches and modest waves, which make for perfect swimming, boogie boarding and kayaking conditions. Dog lovers can also bring their furry friends to Fisherman’s Beach to roam freely off leash. Kayaking and Paddle Boarding: Avila Beach offers pristine, glassy waters for kayaking and the ever-more popular paddle boarding with rental shops nearby. Central Coast Aquarium: Ideally located on Avila Beach’s promenade, the Central Coast Aquarium provides a hands-on, marine life experience with species ranging from clownfish to horn sharks. Apples Galore: If you are here in the fall, apple season is in full swing on the Central Coast. Ride along the Avila Apple Trail to taste local apple varieties, sip on some hard cider and pick apples yourself. Wine Taste by the Beach: With nine wineries located throughout Avila, you can experience quite a unique tasting experience as waves crash in the background. 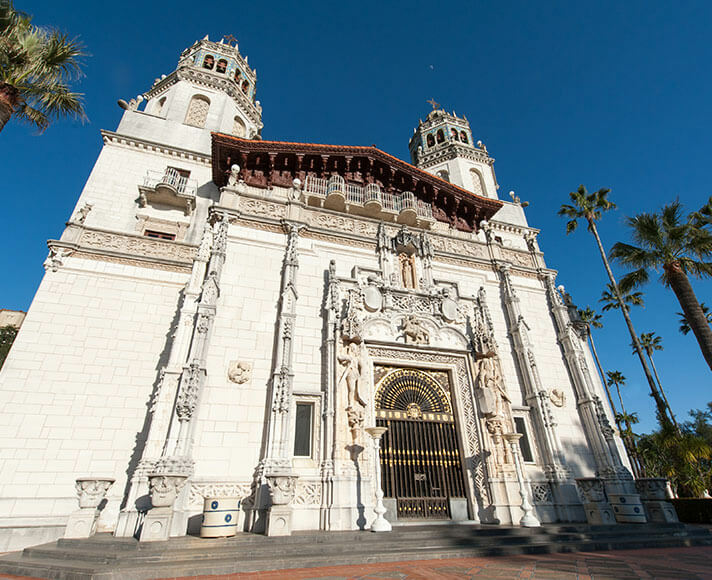 One of California’s top vacation attractions, the legendary Hearst Castle, is just 45 minutes north of San Luis Obispo on Highway 1. 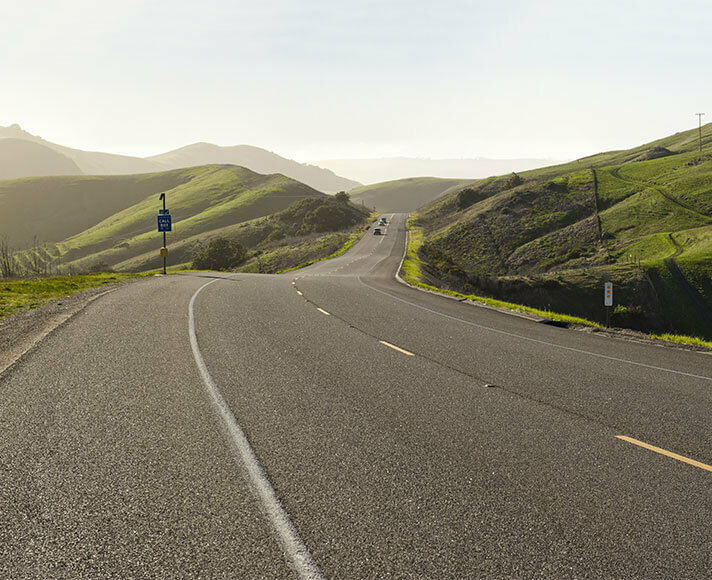 Make your journey as memorable as your destination with pit stops along the Pacific Coast Highway. You will certainly be in awe while cruising along the Central Coast. Taller than the Great Pyramid of Giza, Morro Rock is a must-see natural treasure located at the entrance of Morro Bay Harbor. Stop at the city of Harmony, most likely the smallest town you’ve ever visited with a mere 18-person population. Spot zebras and other exotic animals roaming the grounds at Hearst Castle, which once housed the world’s largest private zoo. Just past Hearst Castle, spot majestic elephant seals sunbathing at Piedras Blancas Rookery, commonly known as the Elephant Seal Rookery. About 2 miles north of the elephant seals is Piedras Blancas Light Station. This pit stop provides a flashback to the past with its well-preserved lighthouse, historic park and wildlife sanctuary. Experience Cayucos, the sleepy surf town nestled in Estero Bay right off Highway 1. This one street town offers local restaurants, shops, and the famous Cayucos Pier, all within close walking distance. If you are in the mood for some fish tacos, stop by the popular Ruddell’s Smokehouse, which appeared on Food Network’s BBQ with Bobby Flay for its 5-star smoked seafood tacos. Don’t miss out on Brown Butter Cookie Company for their delightful melt in your mouth cookies. Meander around the quirky town of Cambria, known for its quaint village full of art galleries, bistros and local shops. If in need for some fresh air, stroll down Moonstone Beach’s one mile boardwalk, weaving along the beautiful coastline, or meander through Fiscalini Ranch Preserve, offering 430-acres to explore with breathtaking views. Now that you have arrived at your destination, enjoy the extravagant Hearst Castle, situated at the base of Big Sur. With an array of guided tours to choose from, experience W.R. Hearst’s world famous estate first-hand, featuring his extensive personal art collection, mind blowing décor, exquisite details throughout and breathtaking views of the Central Coast. Daily tours are bound to sell out so we strongly encourage purchasing your tickets in advance. For a preview of W.R. Hearst’s hilltop retreat, check out our Day Trip to Hearst Castle Photo Tour, featured on the #ShareSLO Blog. Morro Bay and Montaña de Oro are a short 15-minute drive from San Luis Obispo. Morro Bay is a charming harbor town full of outdoor adventure and local treasures. Just 6 miles south of Morro Bay, Montaña de Oro State Park, commonly known as MDO, offers a wide variety of breathtaking landscapes from eucalyptus groves to sandy coastlines. With a two-for-one special, Morro Bay and Montaña de Oro make for the perfect day trip while visiting San Luis Obispo. Clam Chowder: Known for their fresh seafood, Morro Bay has outstanding clam chowder and seafood restaurants located on the bay with a front row seat to the bustling harbor. Salt Water Taffy: Test out all varieties of locally made salt water taffy from vanilla to banana split. Morro Rock: Momentous in size, Morro Rock is a must-see natural gem created by a volcanic plug over 23 million years ago. Black Hill: A quick 0.6-mile hike to the summit, Black Hill is the perfect spot to start your day, taking less than 30 minutes to reach the top with panoramic views of Morro Bay. Museum of Natural History: Located at the base of Black Hill is the Museum of Natural History at the Morro Bay State Park. You can experience interactive ecology exhibits, costing only $3 for those over 16 years old. Morro Bay Skateboard Museum: See a complete history of skateboarding at Morro Bay Skateboard Museum, open daily with free admission. Morro Bay Strand: The Strand is a family friendly beach nearby Morro Rock and Harbor, busy with activity from kite flying to surfing. 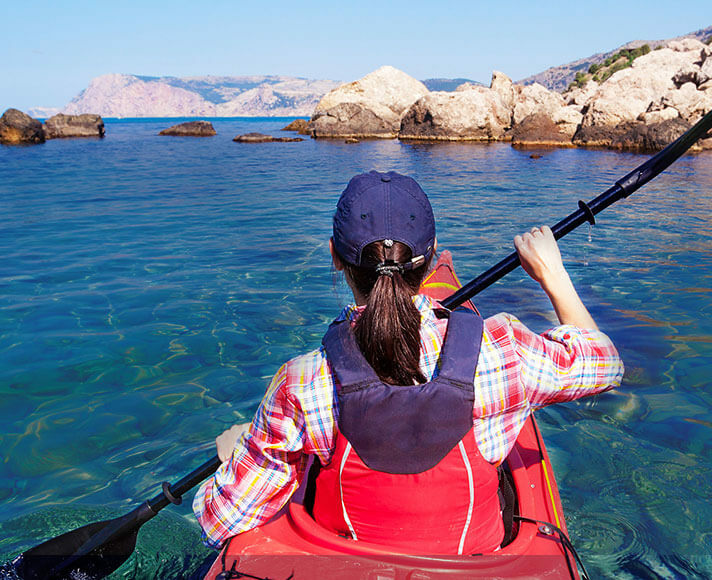 Kayaking, Whale Watching, and Boat Tours in Morro Bay: Hop on a guided kayak tour, chartered boat cruise or whale watching tour and view Morro Bay by water. With an active marine life in the Morro Bay Estuary, you are bound to see sea otters, harbor seals or even whales. Hiking: Endless hiking trails run throughout Montaña de Oro with the most popular including the Bluff Trail, Valencia Peak and Oats Peak. Biking: With designated trails for mountain bikers, MDO is a slice of heaven with spectacular views and technical biking trails. Horseback Riding: Montaña de Oro’s main staging area for horses is Hazard Canyon Parking Area. Enjoy riding through eucalyptus groves and along the bluffs on MDO’s Dune Trail. Beach: With 7 miles of shoreline, MDO has tons of secluded beaches just a quick hike over the sand dunes, making it perfect for a relaxing picnic and experienced surfers alike. Just south of San Luis Obispo are many more fun-filled activities. Whether you’re a thrill seeker looking to reach new heights on ATVs or ready to explore the iconic Monarch Butterfly Grove, your options are endless. Dinosaur Caves Park: This 11-acre, ocean view park is situated right off Highway 101. Popular with dog lovers, families, walkers and photographers, Dinosaur Caves Park is equipped with grassy lawns, playgrounds, lunch tables and walking paths. Great American Melodrama and Vaudeville: Located in Oceano, this theatre has been bringing live performances and entertainment to the Central Coast since 1976. Fun for the whole family, the Great American Melodrama and Vaudeville typically performs comedies, musicals and spoofs. Lopez Lake: Just 25-minutes from San Luis Obispo, Lopez Lake offers laid-back fun for all ages with endless things to do such as fishing, boating, zip lining, mountain biking and more. Monarch Butterfly Grove: This eucalyptus filled grove draws thousands of vibrant Monarch butterflies from late October to February, situated along the Pismo State Beach. It’s quite a memorable experience to say the least! Oceano Dunes State Vehicular Recreation Area: Along the coast of Pismo Beach and Oceano lies the Oceano Dunes SVRA, attracting off-roaders and ATV-riders to cruise the coastline. 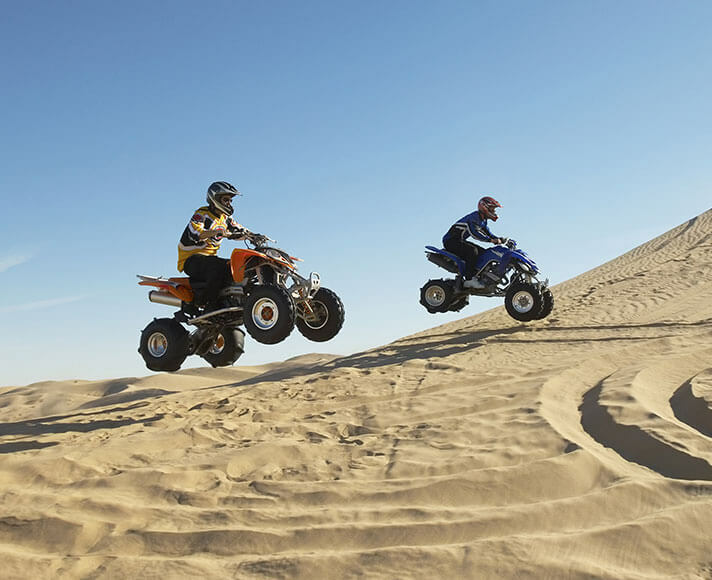 Reserve your ATVs and dune nature tours in advance to secure your spot. Known as “Little Denmark,” Solvang is a quaint village town full of thatched cottages, spinning windmills and rich Danish culture. Solvang is located just an hour south of San Luis Obispo on Highway 101, offering a leisurely drive along the Central Coast, ideal for a day trip. While traveling there, don’t miss out on a cup of split pea soup from the famous Andersen’s Pea Soup in Buellton. Once you arrive at your destination, enjoy perusing the streets of Solvang, feeling as if you have traveled back in time. Boutique Shopping: Solvang is perfect for souvenir shopping with over 150 one-of-a-kind boutique shops throughout the village. Be sure to check out their cuckoo clock stores, one of Solvang’s treasures! Wine Country: Visit these local wineries and tasting rooms in the Santa Ynez Valley Wine Country year-round to try their unique varieties! Old Mission Santa Inés: Known as the “hidden gem” of the California Missions, Mission Santa Inés was originally built in 1804. The mission is open daily for self-guided and docent-led tours of the museum, church and gardens. Museums: If you are a history buff, you will adore the wide array of museums that Solvang has from Danish heritage to motorcycles. Festival Theater: Solvang showcases numerous live performances at their 700-seat open-air, Elizabethan styled Festival Theater. Since its creation in 1974, the theater has hosted nearly 200 productions by Pacific Conservatory Theatre in addition to many other concerts and events. Solvang Trolley: Tour around the village on the Solvang Trolley, a horse-drawn streetcar. All ages will enjoy cruising in this 1915 replica “Honen” as the Danish like to call it. Ostrich Feeding: Ready for quite a unique experience? Ostrich Land is a 33-acre breeding farm where you can feed over 100 ostriches and emus. Make sure these feathered friends don’t nibble on your fingers! Miniature Horses: Explore Quicksilver Miniature Horse Ranch, a breeding facility for under 34-inch horses, and view these fascinating creatures yourself for free. Egg Scavenger Hunt Laguna Lake Park -NEW 504 Madonna Road Hippity Hoppity! Join the Bunny for an exciting adventure while searching for prized filled eggs at the Laguna Lake Park. Ages 8 and under Sat. Hippity Hoppity! Join the Bunny for an exciting adventure while searching for prized filled eggs at the Laguna Lake Park. 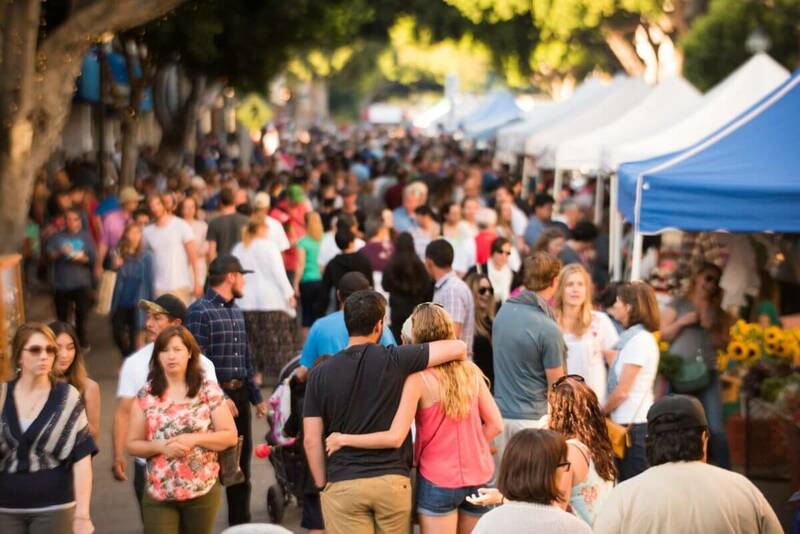 The Market takes place every Thursday evening from 6:00 PM to 9:00 PM (weather permitting and excluding major holidays) on Higuera Street between Nipomo and Osos streets. California Health & Safety Code 114259.5 stipulates that live animals aren’t allowed in certified farmers markets (such as ours) and permitted food facilities, with the exception of service animals. Fraudulently misrepresenting service animals is a misdemeanor (California Penal Code 365.7 [a]). Please, leave your pets at home to keep our Market clean and safe for all guests. The Downtown Trolley operates every Thursday night from 5 PM to 9 PM on a 15-20 minute loop. Parking is available on a first-come, first-served basis along surrounding side streets as well as in Downtown parking garages. 2019 Three-Day Race SLO Festival! 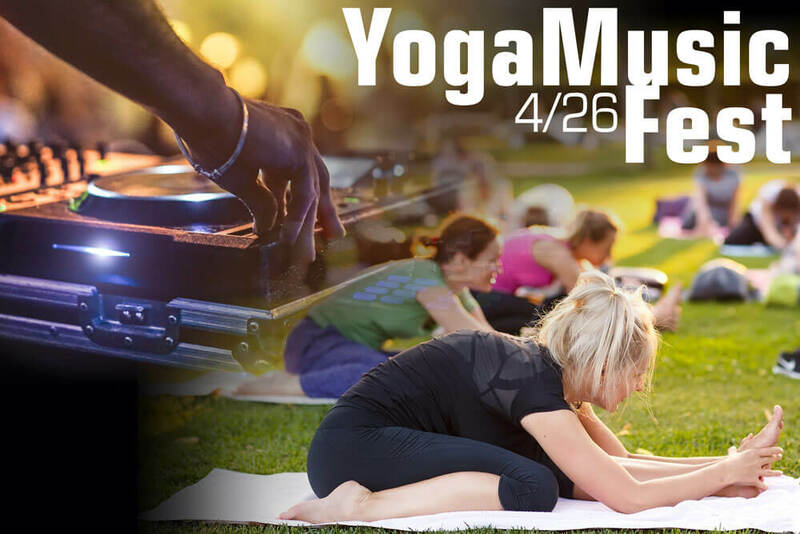 Friday, April 26 introduces our first ever YogaMusic Fest. Admission gets you an event T-shirt or tank top, wristband, sticker, goody bag, parking and access to all 3 workouts! Bring your own yoga mat and water bottle. Dress in layers for outside night time. Local DJ’s featured. Vegan, Gluten Free and Hot Yummy Food Available for sale. Beer, non-alcohlic drinks and Whalebird Kombucha for sale. Vendors selling goodies on site.